Our designers get the job done right, from the foundation on up. Every good landscaping job starts with the excavation; arguably making it one of the most important parts of the project. We believe in doing things right the first time around, which is why we start at the very foundation of the project with the mindset of doing it perfectly right. Here at MD Landscaping, we combine the experience and talent of our team, which makes us the leader in the industry. Our excavation department is no exception. MD Excavation, with its unlimited public works rating in Idaho, specializes in mass excavation, grading, stream restoration, road building, underground utilities and hauling. 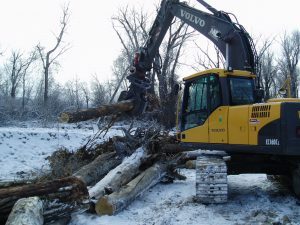 Equipped with state of the art equipment, strong leadership, knowledgeable workforce and determination to expand its scope of services, MD Excavation has built the reputation of being a true service provider throughout Eastern Idaho and Western Wyoming. MD Excavation utilizes its talented staff, state of the art equipment and technology to provide exceptional service to its clients. MD's managers coordinate projects from start to finish ensuring that they are completed on time and on budget and meet clients expectations. The following services are provided by MD Excavation. Stay up-to-date on monthly specials, sales, and other offers!